Sunday night I tuned into the Tony Awards. I had been looking forward to this broadcast, but I’m not sure why for it’s always a guaranteed letdown. Seeing individual musical numbers and snippets of plays strips the shows of their vitality and depth. Fela!, my favorite new musical, and Everyday Rapture, my second favorite new musical, both came across like two steaming piles of crap instead of fresh, innovative and highly entertaining shows. Sean Hayes was the host. He was quite the team player acting the fool in ballet tights, Little Orphan Annie get-up, and in the funniest moment, a Spider-Man suit, an allusion to the stalled Julie Taymor extravaganza that is taking years to open. In an acknowledgement to a very controversial and absurd Newsweek article claiming that an out gay actor cannot convincingly play straight, Hayes engaged in a prolonged open mouth kiss with his Promises, Promises co-star Kristin Chenoweth. Sean and Kristin PDA-ing Al and Tipper-style. The show itself was full of dreadful moments from start to finish, outpacing the Academy Awards in that department. There were odd pairings of presenters, the most embarrassing being Daniel Radcliffe, who I did not realize only stands four feet eight alongside six foot nine Katie Holmes. Katie’s dinky husband must have suggested that match. In another head scratching moment, maybe a perverse nod to “Broadway” Joe Namath, New York Jets quarterback and (who knew?) “theater aficionado”, Mark Sanchez, blandly introduced the musical, Memphis. Much to my dismay, the predictions were spot-on and it would later defeat Fela! for Best New Musical. About ten minutes later, Catherine Zeta-Jones was on stage singing “Send in the Clowns” from A Little Night Music. Milton and I had seen her perform this number decently back in February, but this evening, she was making complete mincemeat out of the show’s signature song. She was over-acting, her voice was off, even her makeup looked gruesome. 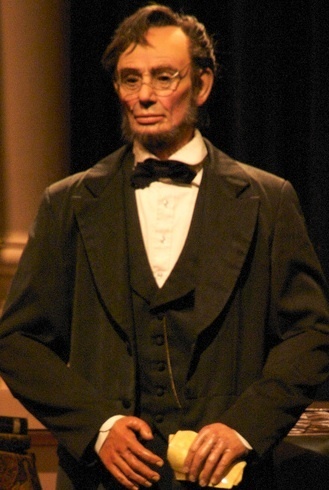 She reminded me of the audio-animatronic Abraham Lincoln I saw when I visited Disneyland in my youth. Milton: Are you watching this travesty? Me: Yeah, what’s going on with her? Is she nervous? Milton: I don’t know. She’s butchering it. This performance could kill Stephen Sondheim. Me: I’m not feeling so good myself. Milton and I remained on the phone for the rest of the broadcast, and watched more low-lights including the montage of all the Best Play nominees. These were disjointed unidentified clips that made every play look like an equally pointless waste of time, defeating the central message of this telecast since it is a three-hour commercial for theater. The musicals, as always, dominated the coverage. Milton loved the performance of “The Best of Times” from La Cage aux Folles, but the splashy song and dance numbers shown from the other musicals Ragtime; Promises, Promises; Million Dollar Quartet; Memphis; Come Fly Away, were all pretty horrible. When Fela! had its moment to shine, with the African-American cast dancing over the entire stage, Milton drolly announced, “CBS just lost Oklahoma.” Many of the musicals were given long-winded introductions that made our minds wander. We began talking about film. Milton: Do you know if that Joan Rivers documentary is available on channel 1000? What’s it called? Me: Joan Rivers: A Piece of Work. It wasn’t when I looked yesterday … Are you planning to see The Human Centipede? Milton: Are you kidding? I wouldn’t pay to see that crap! <pause> I’ll get it on NetFlix. Briefly, the show got interesting when Viola Davis and then Denzel Washington both won for Best Actress and Best Actor for the revival of August Wilson’s Fences. She gave a beautiful heartfelt speech whereas he seemed unprepared as he fumbled through his thanks, but she was a tough act to follow. Milton was bored with Denzel’s remarks, and chose this moment to criticize his suit and creamy color tie. Cate Blanchett, in a shimmering silver suit that won Milton’s enthusiastic seal of approval, presented the award for Best Revival of a Play to Fences. I wasn’t as impressed with her outfit. I thought it looked like something designed by NASA. Towards the end of the show, some cast members from the TV series, Glee, performed Broadway show tunes. Milton is a Glee fan, but he had no idea why this was happening. I think it was a blatant attempt to hang onto the attention of younger viewers. When Lea Michele performed the Barbra Streisand classic from Funny Girl, “Don’t Rain on My Parade”, Milton was so incensed, I thought he might rocket-launch himself out of his hand-cranked Barcalounger and strangle her. Milton worships Babs. Lea Michele sang the same arrangement as Streisand, and she did hit all the notes. Milton grudgingly admitted that she did not destroy it, but there is only one Barbra Streisand, and she will be a tough act to follow. Lea Michele ready to take on Barbra Streisand? I later did some research and have learned that Funny Girl is going to be revived in 2012. Bartlett Sher (who attended the same high school as my brother, Axel, but five years apart) has signed onto direct. He has directed two previously Milton-approved productions, the revivals of South Pacific in 2008 and Joe Turner’s Come and Gone in 2009. Next season, he’s directing a musical adaptation of Pedro Almodovar’s 1988 film, Women on the Verge of a Nervous Breakdown. The big question is who will play Fanny Brice, the role that propelled Streisand to superstardom. 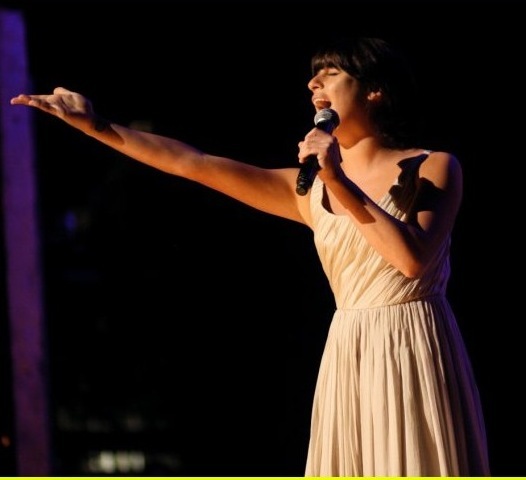 Possibly Lea Michele was using this opportunity at the Tony awards as an audition. According to Wikipedia, she has been performing on Broadway since age 8. Milton and I saw her in Spring Awakening. She was Jonathan Groff’s pregnant girlfriend, Wendla. When Milton reads this, I anticipate that he’ll spit fire. After Memphis won for Best New Musical, the show ended so abruptly, Sean Hayes barely had time to say goodnight, before a second splashy number from this show could be quickly staged. I switched to channel 1000 and told Milton that the Joan Rivers documentary is still not available on demand. This entry was posted in Humor and tagged 2010 tony awards, daniel radcliffe, katie holmes, kristin chenoweth, lea michele, sean hayes. Bookmark the permalink.